Too Young For Reading Glasses? How I fought the inevitable and finally found peace. My eye surgeon rolled back in his chair, folded his arms and paused. He’d performed my laser vision correction surgery several years before and I was back to ask about a problem that I’d been experiencing recently, where the words seem to jump around on the page as I read. He got this serious look and suddenly I was worried. I froze. What did it mean? It must be an acronym for some horrific diagnosis. “What does that stand for?” I searched his face for reassurance. I was flabbergasted! And offended. And OK, a little relieved. “You have common presbyopia—farsightedness.” he explained, which apparently literally means “old eyes.” He said that it was all part of the normal aging process. “Go to a drugstore and pick up some readers. Start with the lowest magnification. It’ll make a big difference,” he said. I stared at him in disbelief as it started to sink in. I need reading glasses? Reading glasses are for old people, I thought stubbornly. “But I’m only 49…,” my voice trailed off. “Get the glasses,” and with that he was off, I assumed, to humiliate his next patient. As I sat in my car, denial set in and I moved through the stages of grief with the speed and agility of a cheetah. Who was he calling old?!? I shed a tear and drove straight to my neighborhood pharmacy. I prayed that I wouldn’t run into anyone I knew. Sneaking up and down the aisles searching for the glasses made me feel like I was doing something indecent. I was ashamed of myself for not being mature enough to handle my new, very mature situation. Suddenly, it appeared, right next to where a small crowd of elderly people had gathered around the blood pressure machine and I thought: I’m one of them now. These are my people. I scanned the display and saw a little chart (called a diopter test chart) with the same phrase repeated in many font sizes—from small to large. “If this line is difficult to read, use 1.00.” Apparently that was the lowest magnification. I found all the glasses ugly. The stock photos plastered on the display were of older couples, enjoying time reading to their grandchildren and knitting. Resentment set in. I couldn’t live with any of the options, so I left, deflated and empty handed. For days I weighed my options. I work in a digital marketing department and I manage production for a large website. I am the oldest person on a team of mostly millennials. Showing up for work wearing reading glasses would just draw attention to my age. As time went by and my eyesight worsened, I struggled to read my computer, phone and tablets by squinting and extending my arms as much as possible while also slightly tilting my head and using my peripheral vision. I was really something to see. Putting on makeup was becoming nearly impossible and I was finding it more and more difficult to see the wisps of hair that were beginning to sprout on my face— the evil spawn of Mother Nature and Father Time. One day—as my 50th birthday loomed—I sat down to watch the Real “Aging” Housewives of Beverly Hills and noticed one of the characters, Yolanda Foster, wearing a pair of lovely turquoise reading glasses. I nearly choked on my ice cream. It was like a thunderbolt. 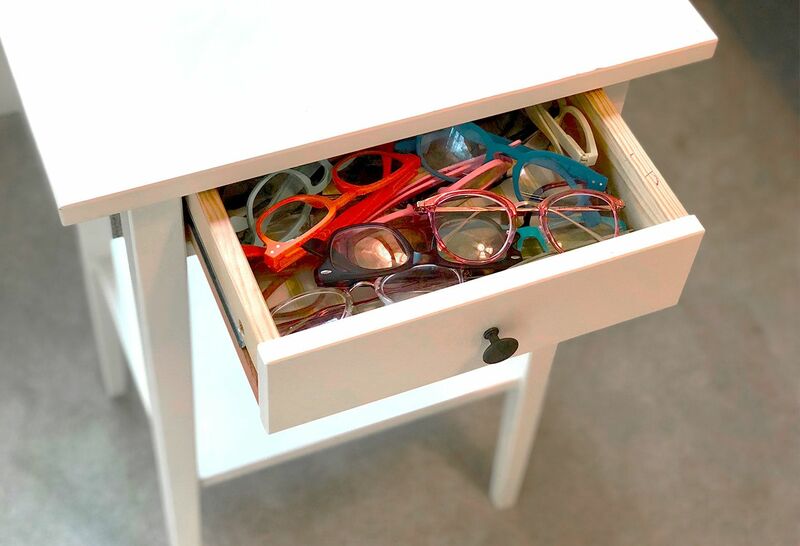 There are companies out there making cool reading glasses! I went to the internet and discovered the phrase “generation ageless,” which describes the new 50-plus demographic. This economically powerful group is determined to rewrite the rules of aging. I felt proud of my cohorts and grateful that I could benefit from retailers who were listening. My research yielded a number of online companies that would send me glasses to try on in the privacy of my own home. I could buy and return (for free!) as many pairs as I liked and no one but me and my postal carrier needed to know. I ordered 15 pairs and anxiously awaited the box’s arrival. It was like Christmas morning when it finally came. After a mini-fashion show in my bathroom, I settled on several pairs and no—none of them hung from a chain around my neck! I’m now embracing my new accessories and having fun with them. 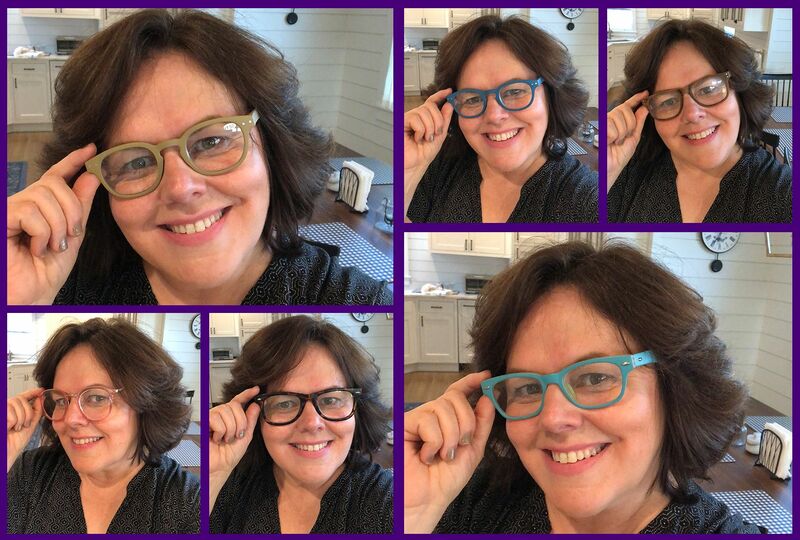 Because a person’s magnification needs change over time, I am now the proud owner of dozens of reading glasses in all styles, colors and strengths. And things at work are just fine! As a matter of fact, I now hear “cool glasses!” from my beloved millennial coworkers as they walk by my desk. Think you need glasses? Find an optometrist to "see." Learn more about the ophthalmology services offered at Northwell. Read more stories from our So You're... section on The Well.